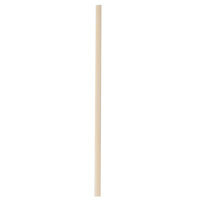 Satisfy the coffee-lovers at your establishment with these Royal Paper R825B 7" bamboo coffee stirrers. An all-natural option for your coffee service, these stirrers are produced from 100% pesticide- and chemical-free bamboo. In addition, bamboo is a renewable and eco-friendly substitute to other disposable materials, so you can be sure you're always displaying a green initiative to your customers. With these 7" bamboo stirrers you can enjoy the convenience of disposability without the guilt. At 7" these are the best stirrers i've found. Some others are too short, and you can't reach the bottom of the cup like you can with these. The stirrers are perfectly functional. I don't feel like they are very nice looking or feeling, but they will get the job done. They were also a fantastic price! Our restaurant strives to reduce plastic waste and consumption. These wooden stir sticks are a really nice choice over plastic straw stir sticks for coffee drinks. Love these bamboo eco friendly stirrers. They are biodegradable as well. They stir hot beverages easily. The sticks are 7" in size so great for large or small drinks. These stirrers are perfect for me daughter's rustic wedding coffee bar! They stick out far enough of the cup so your fingers don't get wet and they don't get soft in the hot coffee like the plastic ones. I hope I have some left after the wedding! I absolutely am in love with these stirrers. The wood is not sharp to the touch with no rough edges. This product us an absolute must have! Awesome stir sticks!! Most customers only need to use 1 at a time, compared to the smaller and thinner ones you can buy, they use 2-4 at a time. Go Eco! Bamboo Grass! 4 stars! Unlike wood, bamboo is grass and keeps growing! And this coffee stirrer is strong and sturdy. We recommend this product! Love this alternative to wood or plastic stir sticks. Some people notice the little details that make your condiments section stand out, and guests appreciate it! These are great. Very smooth. Nice length for multiple cup sizes. I love the fact that they are eco friendly. The price is unbeatable. They also stay firm when dipped into hot liquids. Very economical choice for coffee bars and stations. I prefer these over plastic. The Stirrers are smooth and not rough at all. They won't break or splinter in use. Another excellent value for the money. They're not flimsy so they will your hot beverage well. A definite must have the coffee/tea bar. Great product! Our customers will not stop raving about these stirrers! They don't splinter or snap like the wood ones do and they are all uniform, which we love. Love theses stirrers. People had commented on not liking the plastic stirrers and some of the wooden ones are a bit flimsy when used in hot liquids. These were a hit at the coffee bar and we will be using these from now on. Very economical too. These are such a classy option to offer our guests! They will be perfect for our event and add a classy touch, opposed to the basic plastic stirrers. These are nice and smooth. Some are not straight but who cares. I like this alternative to wood. They are a great size for most coffee cups. These do indeed stir coffee, the coffee doesn't even put up a fight against these stirrers. its also nice you can buy a bag as we do not go through a lot. We love these! We drink a lot of coffee and tea in our office. These are tall enough for our tallest glasses. They hold up well and rarely splinter.